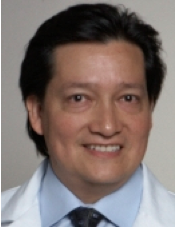 Dr. Diaz began his training in medical genetics as the recipient of a Lucy Moses Research Residency Fellowship in 1994. He completed training in Pediatrics and Medical Genetics and joined the faculty of the Department of Human Genetics in 1999. His research efforts have been focused on the identification of the genetic basis of single gene disorders, with a number of discoveries published to date including thiamin-responsive megaloblastic anemia syndrome, autosomal recessive Kenny-Caffey syndrome, WHIM syndrome, autosomal recessive myelokathexis, and choanal atresia-lymphedema syndrome. In addition to laboratory research, Dr. Diaz has been involved in clinical research efforts in developing new therapies for genetic diseases. His clinical focus is on inborn errors of metabolism and he is a site Principal Investigator for the NIH-funded Urea Cycle Disorders Consortium. He was the lead author on the pivotal study demonstrating the efficacy of a new treatment for urea cycle disorders, glycerol phenylbutyrate, and has been involved in a number of other clinical trials related to other disorders. He has published over 75 peer-reviewed articles and chapters related to his laboratory and clinical research efforts and he has presented his work at numerous scientific meetings and hospital grand rounds. Dr. Diaz is Board Certified in Pediatrics and Clinical Genetics. He is a member of the American Society of Human Genetics, the Society of Inherited Metabolic Disease and the Society for Pediatric Research. He has been involved extensively in clinical research and teaching at Mount Sinai including roles as Program Director of the Medical Genetics training program, Associate Medical Director of the Mount Sinai Clinical Research Center, Assistant Director of the Mount Sinai Medical Scientist Training Program and Medical Director of the Mount Sinai Genetic Testing Laboratory. He has also served on the medical or scientific advisory committees of the Coriell Institute Human Genetic Cell Repository, Hyperion Therapeutics Urea Cycle Disorders National Advisory Board, and Genepeeks. Dr. Diaz received his M.D., Ph.D. degrees in 1994 from the State University of New York Health Science Center at Brooklyn after earning a B.A. from Cornell University.